The imaging of food has changed significantly over the course of the last century. By imaging, I refer to the development of aesthetic idealizations and portrayals of food as elements in a carefully constructed narrative. Our culture is defined by visual processing of images designed to infiltrate the conscious with underlying messages. These messages create discourses about the object in question, which the object itself helps to create. Within the context of the industrial food system, the manipulation of imaging of food creates false pretenses that destroy the connection between the individual and food. The inaccessibility of images marks a misunderstanding about industrial food that allows us to become ignorant of the signals images send us. The industrial narrative of food derives from the modern promise of progress. Images of food can be used to craft industrial standards, create art, persuade us to consume more, and to create truths in representations that are ultimately designed to fail us. By creating and attaching images to food, we are assigning it an identity constructed on the foundation of false representation and discourse. Why are modern images of food so abstract and far from our realities as contemporary consumers? The hidden truth behind the industrial narrative of food is this: The deeply rooted, false imaging of food that controls markets of today stems from a historically broken connection between the individual and food. Friedrich Nietzsche’s perspective on imaging and the creation of truth is useful in the initial understanding of how and why these elements of discourse are formed. According to Nietzsche, images are metaphorical ideations that are processed through nerves and interpreted visually. Images first manifest as naked stimulus in the brain as our conscious experiences of the world bombard us with stimuli. If we are in constant contact with images, our brains receive them and attach metaphorical attachments to them. We learn to prefer certain images over others due to the conditioning of our brains in seeing repetitive images that are associated with positive stimuli we’ve previously experienced. This pattern has created a culture of visual stimulation that drives our need for visual pleasure, thus making the creation of industrial images so successful. But in fact, the truths that we conjure are really ambiguities that lie within an object. Similarly, Michael Foucault’s discussion on discourse weaves a parallel path of creation. Sara Mills’s Discourse explores Foucault’s idea of truth that echoes Nietzsche: “Truth is of the world; it is produced there by virtue of multiple constraints… Each society has its regime of truth, its ‘general politics’ of truth: that is the types of discourse it harbors and causes to function as true” (Mills 18). Power’s role in discourse shapes the ability to keep a truth in place. “Power is dispersed throughout social relations” and “it produces possible forms of behavior as well as restricting behavior” (Mills 20). The agency to form discourses and to create narratives out of them lies in the hands of those with power. This raises an important question in the understanding of the reigning industrial food industry: Who possesses the power to rewrite narratives and who does not? The overwhelming influences of the American media and government dictate much of what is created within the discourse of industrial food. The entertainment sector of the media creates representations of food linked to art and identity. For example, the identity of the celebrity chef creates an image of food portrayed as an art form to be visually consumed by the viewer. “Chefs are different because they are connected with something that we may get aesthetic pleasure out of and even call art” (Rousseau xvii). The celebrity chef simultaneously creates a relationship with the viewer as well as an image of identity. The food itself becomes secondary, irrelevant to the reality of viewers’ lives, leaving a much more impactful mark on the idea of lifestyle. Rachel Ray, for example, holds a great deal of agency over the marketing of lifestyle. Her image creates representations of compatibility with the average, working class American. “Her unaffected girl-next-door style validates the lifestyle choices that many people make, particularly those-like using convenience products-that lie distinctly outside traditionally elite and professional food cultures” (Rousseau 68). Despite Ray’s significant affluence and success that places her in the top earning margin of American workers, her viewers are nonetheless enchanted by her image supported by the illusion of ease in her marketed “30 Minute Meals.” The modern constraints put on the individual place emphasis on the necessity of time in a world lacking adequate time to carry out the responsibilities of the default contemporary role. Ray’s image creates the illusion of time through her meals crafted on television, somehow permeating the notion of “saving time” to the viewer. Although time and convenience are crucial to Ray’s brand, the fact that her media is being consumed through the screens of televisions creates another sense hypocrisy. “The central feature of television is not that we consume its images, but that it consumes our time” (Rousseau 67). Viewers gain a sense of satisfaction in consuming the visual tools Ray provides in order to be a more successful participant in fast-paced modern life. “But the distraction she provides is all the more powerful because it parades as real life, an effect which is jointly achieved by the reality component of many food shows and the fact that these representations can and do influence the way people eat and behave” (Rousseau 69). Ultimately, Ray and other celebrity chefs hold the power to craft whatever narratives about food they wish to within the realm of media consumption. By giving viewers the ideal identity, a need to spend and consume is initiated in order to achieve such lifestyles. Celebrity chefs pride themselves on the selling point of their images of not only their identities, but the food that is comprised of their identity. Identities created by images are essential in the process of selling food to consumers. Visually, consumers are manipulated to buy industrial foods. The outside forces are able to control the consumer due to the individual’s lack of agency left in the wake of modernity. Before industrial foods conquered the supermarket, the relationship between the individual and food looked very different. In the pre-industrial agricultural landscape of the United States, farmers were deeply connected to their crops and land. The Industrial Revolution of the 19th century and the First World War altered agriculture by mechanizing its elements in order to make processes more efficient. “The chemical fertilizer industry (along with that of pesticides, which are based on poison gases developed for the war) is the product of the government’s effort to convert its war machine to peacetime purposes” (Pollan 41). By synthesizing nitrogen that was once utilized in the process of bomb-making, fertilizer became cheaper and more useful than ever to the modern American farmer. A shift in social structures marked new habits concerning food, as well. The migration of bodies from the countryside to urban areas altered socioeconomics and brought more consumers to the forefront of the burgeoning economy. The pastoral life of primitivism once championed by Romantics became a landscape of soot and smog that modernists like T.S. Eliot lamented over in modern poetry. Most importantly, the post-war culture of food gave rise to a new modern era of freedom of choice due to lack of scarcity. Technology delivered the ultimate gift for the industrial food system: abundance of capital. “Perhaps the central element of modernization- and, indeed, a crucial factor in all the facets of modernity that I will highlight- is the rise of mature capitalism” (Singer 21). With the rise of capitalism came changes such as “rapid urbanization and population growth, new technologies and transportations, and new forms of mass communication” (Singer 21). These modern advances stemming from mature capitalism evolved into elements of a neoliberal construct. According to Singer, “Modern capitalism redefined the basic social unit from the group to the individual” (32). In this way, more responsibility, or “neoliberal responsibilization,” is put on the individual to consume and act in accordance to individual needs (Guthman 193). The term “neoliberal” is applicable to such advancements made in the age of mature capitalism because they serve to control and dictate actions of consumers. Many technologies arising from this age pose as “purchasable solutions” that enter into a cycle of commodification designed to keep the consumer spending more money (Guthman 191). The USDA, for example, is another organization that holds agency to create neoliberal narratives of food and nutrition. If we look at the “food pyramid” designed by the USDA to educate the public about healthy sectoring of diet, we can see that its image and design has changed along with the current narrative in place, usually based on the current scientific climate and research. Most recently, the image of the USDA’s food pyramid has been replaced with the image of a plate divided into four sectors with an additional outside sector of dairy. The evolution of images is a testament to the evolution of power within the discourse of industrial food. Images are used to persuade the consumer to purchase and consume what is labeled as nutritious for the body. The lost connection between the individual and food is replaced with an image, a guide to navigate the aimlessness of “the now” that was once connected to the individual. To combat the sense of aimlessness, the key role of neoliberal imaging in the industrial food system is to harness the power of nostalgia and genetic memory that once revolved around an intricate system of primitive food practices. Images harness this power and drive the marketing of specific varieties of mass-produced food that support the structure of the industrial food system. 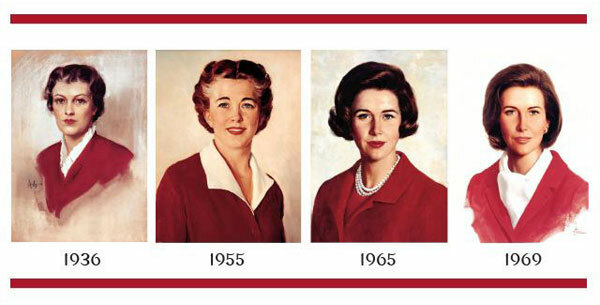 For example, the creation of Betty Crocker’s image in 1921 defined the branding of General Mill’s food merchandise. A fictional character characterized by a smiling, early forties-aged woman evolved over the years as American culture changed. Betty Crocker’s iconic status in the lives of American housewives is built upon a historical foundation of “simultaneous loneliness and false intimacy” according to page 47 of Pamela Rossi-Keen’s “A Taste of America’s Story through Finding Betty Crocker. “Such a relationship allowed for an identity construction- or identity rejection (at least a theoretical one)- for the homemaker” (Rossi-Keen 48). By creating identities between food and the consumer, a representation of a relationship is produced. “Brand loyalty” is one concept that arises from the relationship of the consumer and product. In the early case of Betty Crocker, the image of her identity provided a level of comfort for the disillusioned housewife and became a critical success in the marketing of food images. Culturally, the crafting of a false identity greatly impacted the constrained images of roles women played in the early twentieth century. These representations not only extended themselves to the reworking of the individual identity, but the identity of one’s landscape, as well. Pastoral fetishism permeates through modern images of food, crafting pastoral identities that consumers live vicariously through. Common processed foods that are manufactured through technologies like genetic modification are identified by images of animals, sunshine, and blue skies. The call to nature that is seen through images triggers an innate desire of the individual to revert back to primitivism. Technology has allowed for abundance and surplus of food that seems to conjure a sense of ultimate freedom from the binds of nature. Yet, pastoralism in itself possessed a definitive sense of freedom based on the wild of the land. Pastoralists were not bound by societal constraints or practices that dictated their lifestyles. “In societies that rely on gathering and hunting for their food, neither land nor wild animals can be claimed as the property of any one individual” (Sayre 3). An immense degree of freedom was held within the American pastoralist to move freely about the land, living in symbiotic bliss with nature. The modern individual is constrained by the freedom of the supermarket. Choices limit the imagination, and images of pastoralism are one of the few ways in which primitive desires are provoked, initiating purchases to compensate for this loss. The deeply rooted cultural practices of food have been forsaken. In their places remain solutions designed to subdue the consumer. Another way to discuss neoliberal imaging of food is to expose its hypocritical technologies; in the wake of the industrial revolution and initial manipulations of images, new neoliberal technologies continue to control the discourse of faith in progress. As we’ve previously touched on, the realm of government institutions and science dictates the discourse of food imaging. Technological practices paradoxically create physical images of food that contradict the images created by its discourse. To illustrate this, we can use hyperspectral imaging, a neoliberal technology designed to break down and image the nutritional content of food, as a means to show the impact of the way in which the industrial food system perceives food itself as well as nutrition. The scientific community describes hyperspectral imaging as “one of the most powerful and fastest-growing non-destructive tools for food quality analysis and control” (Sun xiii). 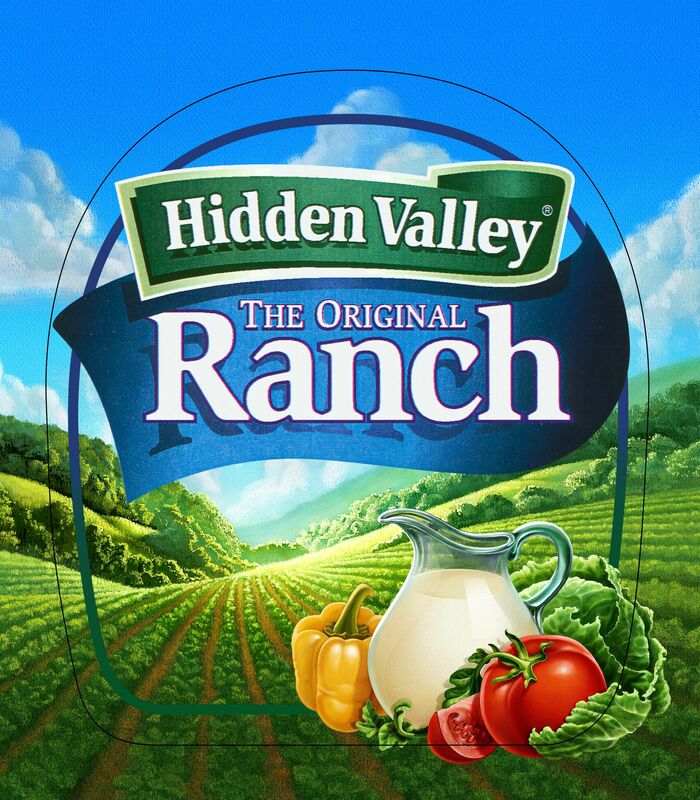 Yet, the image of nutrition captured by an infrared picture is vastly different than the image of a lush green valley on a container of a product like Hidden Valley Ranch Dressing. Quality assessment and assurance are of driving importance behind the motivation to promote hyperspectral imaging. Through quality assurance of a product’s safety, “it encourages loyalty in consumers and results in the expanding market share” (Sun 4). The thinly veiled promise of capitalism covers the scientific rhetoric of technologies like hyperspectral imaging. Behind the veil, the actual physical process of the imaging begins with a conveyor belt filled with food products. The belt passes underneath the hyperspectral camera, and the images are transferred to computers as small, miscellaneously colored infrared shapes. The database detects the individually colored images and processes their nutritional content based on color. For example, three different types of cookies pass underneath a hyperspectral camera. The camera is able to detect the variations in fat content of the cookies and transfers the data to the computer. This type of technology utilized by the food industry poses as a scientific solution to provide more accurate nutritional information to a society plagued with one of the world’s highest rates of obesity. Technologies like hyperspectral imaging ignore the underlying issues behind public nutritional issues because the technologies themselves are neoliberal solutions that sustain not only the industrial food industry, but the construct of modern capitalism itself. Technologies of our “faith-in-progress” era are designed to keep us in the dark. The real issues are invisible, shrouded behind commoditized solutions with satisfyingly numbing images attached to them. The reality of imaging lies within small efforts taken on by activist organizations whose missions are to expose the truth behind industrial food imaging. As a result, smaller initiatives are beginning to expose the main discourse of the disillusive reality of imaged foods. Animal right’s organizations like PETA, although possessing their own individual agendas, work to illustrate a different reality of food through images labeled as the truth. Through use of graphic imaging to shed light on the abuses of industrial farm animals, viewers are confronted with a reality that goes against the narrative that has been normalized in their lives as consumers. “Such tactics assume the shock or surprise of violating norms of appropriateness allows the message to get the audience’s attention and have them attend to the pertinent message” (Scudder 1). In a 2007 study of the effectiveness of PETA’s use of graphic imagery, it was reported, “that PETA’s attack message against abuses at corporate pig farms was effective in eroding the credibility of the corporate food-industry raising animals for consumption” (Scudder 1). Yet, “It is unclear, however, whether the use of negative graphic imagery resonates with the public to change attitudes” (Scudder 1). While images may expose or attempt to rewrite truths, the overall attitude and climate of reality may remain unchanged. Whether this stems from the power of discourse preventing change in attitude, it is unclear but may stand as a substantiated theory. The severed connection between the individual and food is responsible for the neoliberal discourse of industrial food. Connotative images attached to food represent the idealized identities that subconsciously transport the consumer back to a time of pastoralism and primitivism. Modernity has rewritten the narrative of food. Over the course of the twentieth century and onward, food became conquered, economic, and lost all cultural connections to intimacy. Images of pastoral scenes on packaging of products hide consumers from the reality of its manufactured and processed contents. Yet, it’s the visual satisfaction of the images that blind the consumer into believing a truth designed to coerce and subdue the neoliberal mind. The narrative of industrial food must be performed and practiced in order to keep its sustained power over consumers. This practice of structure naturalizes the creation of its truths. The only way to revert back to primitivism is to consciously reject the climate of neoliberal practice, yet this is nearly impossible to abandon completely as an active consumer. In order to survive, we must consume. However, the conscious understanding of the images that we visualize serves as a tool against the systematic practices of neoliberal imaging, perhaps offering the modern consumer a small victory of agency. Guthman, Julie. Neoliberalism and the Constitution of Contemporary Bodies. New York: New York U, 2009. Print. Mills, Sara. Discourse. London: Routledge, 1997. Print. Rossi-Keen, Pamela. “A Taste of America’s Story through Finding Betty Crocker.” Review of Communication, vol. 9, no. 1, Jan. 2009, pp. 47-50. EBSCOhost, doi:10.1080/15358590802276069. Rousseau, Signe . Food Media: Celebrity Chefs and the Politics of Everyday Inference. London: Berg, 2012. Print. Scudder, Joseph N., and Carol Bishop Mills. “The Credibility of Shock Advocacy: Animal Rights Attack Messages.” Public Relations Review 35.2 (2009): 162-64. Web. 7 May 2017. Singer, Ben. “Meanings of Modernity.” Melodrama and Modernity. Chichester: Columbia U Press, 2001. Print. Sun, Da-Wen, ed. Hyperspectral Imaging for Food Quality Analysis and Control. London: Elsevier, 2010. Print.